Be the first to share your favorite memory, photo or story of Marcia. This memorial page is dedicated for family, friends and future generations to celebrate the life of their loved one. 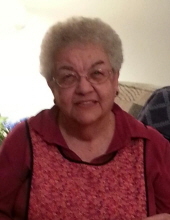 Marcia C. Weber, 80, of Waterloo, died Friday, Nov. 16, 2018 at her home. She was born March 20, 1938 in Oelwein, daughter of Ernest and Catherine Russell Fauser. She married Jerome “Jerry” Weber on February 11, 1957 at St. Mary’s Catholic Church, Waterloo. He died March 14, 2012. Marcia graduated from St. Mary’s Catholic School, Waterloo and was employed at St. Francis Hospital and retired from Mid-Continent Bottlers. Survivors include: two sons, Mark and Paul, both of Waterloo; two daughters, Julie Berendes and Angie Swanger all of Waterloo; seven grandchildren, Ryan (Ali) Weber, Amanda (Michael) Mize, Chassidy (Keith) Bumgardner, Chaz Weber, Josh, Jenifer and Jordan (Brittany) Berendes: 13 great-grandchildren, Natalie, Ricky, Billy, Emmalee, Eddie, William, Alex, Gabi, Kylier, Joshua, Elliott, Ariyanna and Bentley; three sisters, Ginny Weber and Sue Fauser both of Waterloo and Gail Jensen of Phoenix, Ariz.
Services will be 11 a.m. Tuesday, Nov. 20 at Blessed Sacrament Catholic Church with burial in Mt. Olivet Cemetery. Public visitation will be from 4 until 8 p.m. Monday at Hagarty-Waychoff-Grarup Funeral Service on South Street where there will be a 7 p.m. rosary/vigil service. Visitation will continue for one hour before services at the church on Tuesday. Marcia loved playing the piano and the organ. She sang in the choir and was a cantor at St. Mary’s Catholic Church and also Blessed Sacrament. She later was considered a committed prayer warrior. Her shields of honor were her many aprons that she often forgot she was even wearing. To send flowers or a remembrance gift to the family of Marcia C. Weber, please visit our Tribute Store. "Email Address" would like to share the life celebration of Marcia C. Weber. Click on the "link" to go to share a favorite memory or leave a condolence message for the family.